While looking over my DXCC statistics I noticed that my log didn't match the DX station's log as uploaded to Clublog. I double checked my log and it looked like a good QSO but upon checking with the DX station it was determined that I had not, in fact, made it successfully into his log. But in grand amateur radio fashion he offered to set up a sked with me for the following afternoon so we could work and I could get Scotland on CW in my logs. I had never had a scheduled QSO with someone I didn't know and was a little uncertain if it would actually happen. We had agreed to a frequency on 20m and I was monitoring it ten minutes before the appointed time. Unfortunately for the both of us, the previous day I had removed my trusty J-38 key from service and replaced it with a set of Vibroplex paddles. Since I hadn't actually used the paddles in years my fist left something to be desired. It was amazing that Andrew could actually tell what I was saying in the first place! A few minutes early I started calling him but didn't hear a response. A few minutes later, right on time, I heard a strong signal calling me. VOACAP had certainly predicted the propagation correctly as his signal was registering 40 dB on my signal meter. After a quick contact on 20m we decided to meet on 30m to give that band a try. While not as strong, we were able to make contact there as well adding a new band for Scotland for me. 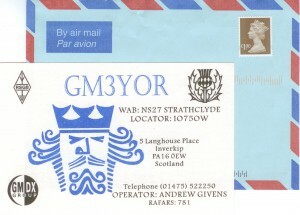 I was quite pleased with making this contact but even more so when, after only a few days, I received the above envelope and card in the mail. 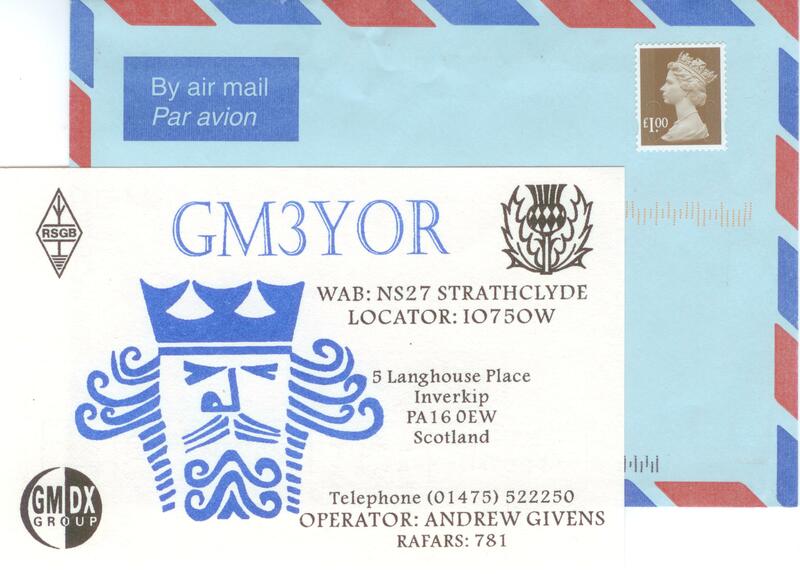 A fast QSL with a nice card! Andrew certainly exhibits really good amateur radio values. Thanks Andrew!